In Enrique Tomás we are great lovers of a good curing, one of the most outstanding products of the gastronomic culture of Spain. That is why we offer you the best ham from Cáceres-Badajoz, also known for its designation of origin as Extremadura ham, so that you can enjoy a unique and delicious product, typical of our land. The dry curing of this region is perfect for those who are looking for a product full of nuances and aromas, with an elegant taste that turns into a real explosion in the mouth. And when it comes to buying ham from Cáceres-Badajoz, at Enrique Tomás we have the best offer on whole pieces of Iberian cebo, pieces and slices of bellota ham 50% iberian and 100%, delicious travel packs with the piece perfectly cut and packaged for you to take with you wherever you want, or our exquisite tasting box, with a selection of Iberian ham and bellota 100% iberico sausages from this origin, an ideal gift for lovers of quality taste! The Iberico bellota ham from Extremadura is intense, elegant and very characteristic. It is a ham full of nuances and very aromatic for both the nose and the palate. When tasting it you can notice how the mouth is filled with aromas that become an explosion for the palate, but the most incredible thing, and that only happens with this ham, is that when swallowing the slice all those wonderful flavours disappear as quickly as they appeared. 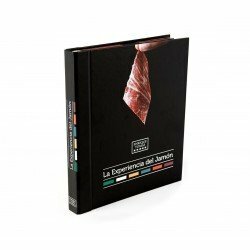 This pleasure could only be achieved with a product of exceptional quality which, thanks to the climate of the region, the recipe of the chefs and its perfect curing, becomes one of the best options for ham lovers. When it comes to buying Exremadura ham online or in our physical stores, we want to make it as easy as possible for you. That's why at Enrique Tomás we not only care about quality, but also about finding your favourite products in a simple way. If you are a follower of the Cáceres-Badajoz ham, in our shops you will find it with a blue E, a sign that allows us to quickly know the origin of the product to experience this explosion of flavours at ease. When it comes to a product full of nuances, perfect for tasting on the most special occasions, there is no doubt that this ham is one of the best alternatives.